Position a rack in the lower third of the oven and turn it on to 350 degrees. Butter the bottom and sides of a 9-inch cake pan, then line the bottom with a round of parchment paper cut to fit the bottom and slather it with more butter (about a tablespoon). Sprinkle ½ cup of the pumpkin seeds in an even layer on the bottom of the pan, then sprinkle with 2 tablespoons of the sugar. Set aside. Measure the remaining 1 ¼ cups of the pumpkin seeds and 1 cup of the sugar into a food processor. Pulse the machine until the seeds are pulverized and resemble damp sand. Add the eggs and the 4 ounces of butter and pulse until everything is incorporated. Add the flour, baking powder and tequila and pulse again, just until everything is combined. Chop the chocolate into pea-sized pieces and add it to the batter. Pulse until the chocolate is mixed in. Scrape the batter into the prepared pan and bake until a toothpick inserted into the center comes out clean, 35 to 40 minutes. Let the cake cool for ten minutes, then unmold it onto a platter, remove the parchment paper and serve. Sounds good. Will try it. I am going to make this cake for CInco de Mayo. Does the Mexican chocolate have cinnamon and/or almonds? I have a local source for Tazo, but it they only stock plain dark and 70%, chili or cinnamon only. Can you please advise? Thank you and good luck in Chicago! Any of those would work! We generally use the Cacao Puro – but the cinnamon would be delicious too! A co-worker made this cake today for a birthday! Yum, yum, yum! Truly a keeper. Can I use Chocolate Abuelita? We made this and it was great!! We used grated Mexican sugar ( the cone type) for the 2 tablespoons, the added richness from the molasses added more depth than the white sugar called for. We mixed 1 cup of heavy cream mixed with a heaping teaspoon of Greek yogurt and cultured it in our yogurt maker for 12 hours chilled it and whipped it with 2 teaspoons of honey. We served the cake, with the cultured whip cream and some balsamic pickled figs that we had canned the day before. Totally amazing!!! I came across your show on PBS recently – you happened to be making this cake. It looked simply delicious on tv so I tried it out for my family. Everyone loved it! Definitely keeping this one in my recipe box. I’d like to try making this with a gluten-free flour like King Arthur. It usually substitutes well for regular flour. Any suggestions? Ahhh the gluten free quest! I have been working on this a lot with my home cooking as I now have a person with Celiac’s in my household! I would not reccommend th King Arthur flour mix. I have used it and it is fine, but it is no where near a close ratio of regular flour to gluten free flour. Trader Joe’s makes a decent mix that I HAVE used for this recipe and I simply used less of the gluten free mix than what the recipe called for in regular flour. However, I have cooked this recipe about 50 times and I am very familiar with the consistency – so I was able to eyeball it. My best reccommendation is to use Cup for Cup gluten free flour. It is available at Whole Foods and online and other smaller baking shops. It is AMAZING! I made pie crust and empanada dough with it and it is perfect. And it is also called cup for cup because it is just that. It is an equal substitute for flour. So you can follow any recipe and use this flour. It is not the cheapest so my pantry at home always has cup for cup for baking, and then the trader joe’s mix for anything else – thickening sauces, breading anything, etc. can i make this cake in a stand mixer instead of food processor? Can i use a stand mixer instead of a food processor? The food processor is needed because you are making the pepitas into a flour of sorts. A stand mixer will not have the same affect. 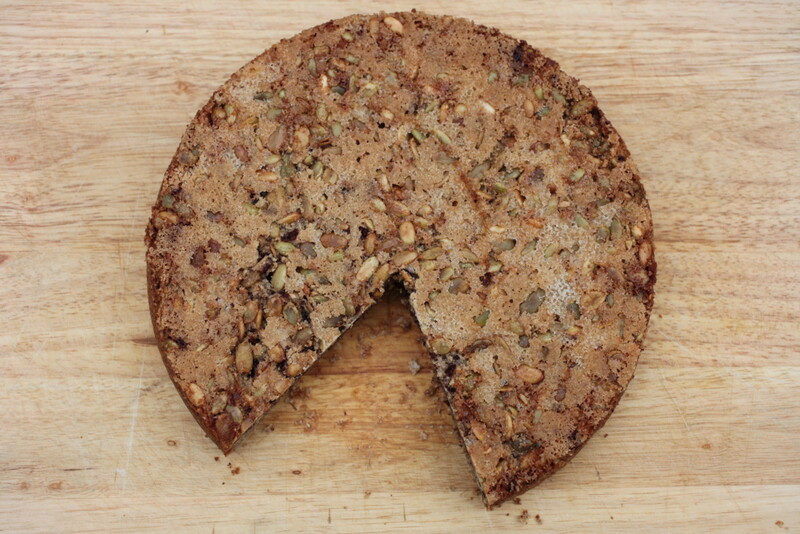 I don’t know what I’m doing wrong, but every time I make this delicious cake, the pepitas stick to the parchment paper & I have to try to carefully pull it off. Most of the pepitas stuck to it. Lots and lots of butter will save you! I mean LOTS! Butter below the parchment and over the stop before you sprinkle with sugar. Any thoughts on trying this with egg substitute? I have a family member who is allergic to egg whites. The one thing I use in my recipes when I want to replace the egg whites is “Bob’s Red Mill, egg replacer”, you can find it in the baking aisle. It’s a powder and you use 1 tablespoon of the replacer to 3 tablespoons of water and that is equivalent to one egg white. Let us know how it turns out! I know a person allergic to chicken eggs but can eat duck eggs because it is a different protein. I don’t know if that would be a solution for you but i thought it was interesting. I made this cake today. I will certainly make it again!! Very good and easy. Might be good with a little fresh whipped cream. what can i substitute for the tequila? When I saw this being made on the show, Rick included a roasted pepper in the batter. What is that step and do people tend to prefer the cake with or without? It intrigued me, as it seemed so unique. Thanks! I’m thinking of using bobs Red Mill 1 to 1 gluten free flour for this cake. It works well in most baked goods. I have Celiac disease so I use a lot of gluten free flour products. Bobs Red Mill is sold at Sams Club for a decent price. Have you tried out this recipe with Bob’s? I’m curios to see how it turned out for you! I was a little confused about the Mexican chocolate, but this is a specific thing and includes cinnamon and perhaps almond. I didn’t find it at two local grocery stores, but found three kinds at another store that has more ethnic foods. They all have pictures of hot chocolate on the front, but can also be used for baking. I went very heavy on the buttering of the pan and parchment and had no problem with sticking. The cake is great when warm, but I liked it even better the next day when fully cooled. I just saw the show and was interested on the unusual step of adding a chili to sugar water. Why isn’t this step added to the recipe? I was looking for comments on the taste. I was glad for the info on gluten free flour. Does anyone know if you can substitute stevia for the sugar? Nothing like being type 1 diabetic and allergic to wheat when you like to bake. I would say yes to substituting Stevia but I don’t know the ratio Sugar to Stevia. Delectable! Made this exactly as the recipe provides except I left out the tequilla (didn’t want to buy a whole bottle for a tablespoon) and I used regular chocolate, not Mexican. I wouldn’t change a thing as we gobbled the whole thing up in two days. Hi all, tried this recipe recently and we all thought it was wonderful. My son now wants to try adapting it for cupcakes for a party. Anyone tried that? Wasn’t sure if cupcakes would release from pan more neatly using buttered parchment circles per recipe or just go with paper muffin liners? 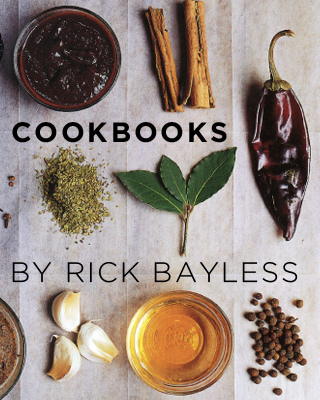 I just watched this and Rick added two ancho chiles to a simple syrup, chopped them and put them in the batter. Why has this step been deleted from the recipe? I think this will clear up the confusion. The recipe above is not from the television show, it’s from the “More Mexican Everyday” cookbook.